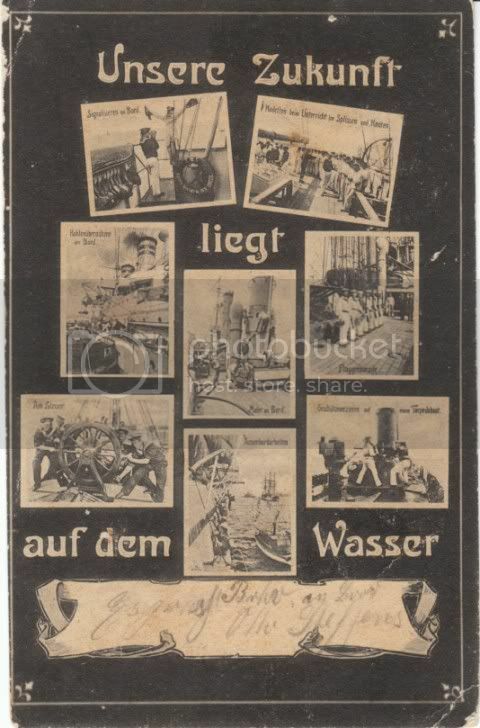 the caption of this card reads "Our future lies on the water", an interesting idea for a country with a small coastline and short naval history. A call to increase the German navy went out as a result of the late-19th and early 20th-century scramble for the last of the available areas of the globe for colonization. The 8 views on this card show a well-disciplined and modern navy. the postcard was mailed to New York in 1906. Here is a picture postcard view of the German cruiser SMS Emden. This version of the ship is the 1908-1914 version and shows Captain von Mueller and German naval flag in the inset at left.